I’m very happy to say that Brytan Seth Isaacs was born Saturday afternoon, January 17. He was 8lbs 12oz, 21in long, and has a lot of dark brown hair. I snapped a ton of pictures yesterday, but most were duplicates just in case one didn’t turn out. (I love that you don’t have to worry about that with digital cameras. The 21st century is awesome.) We looked through them all and picked 35-40 and uploaded them to Baby Brytan’s website. 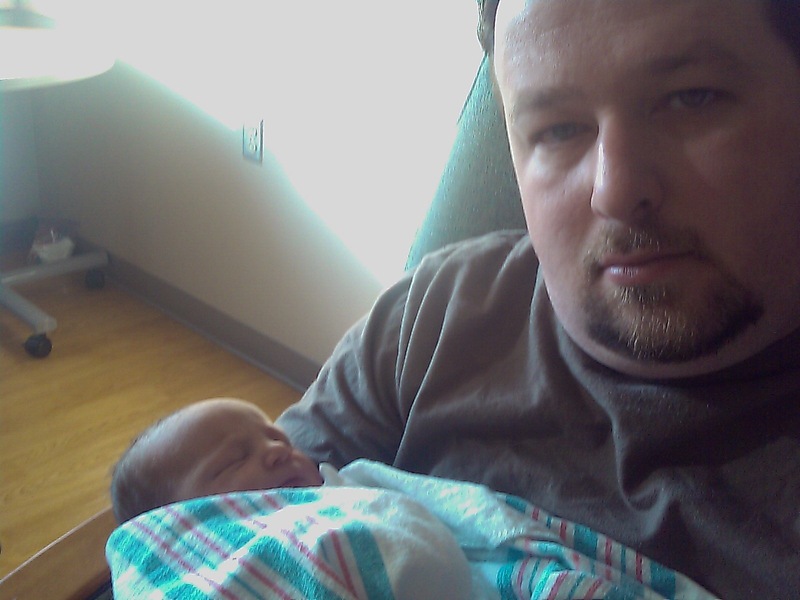 In all the picture snapping the only picture of myself with him was when I was cutting the cord. I didn’t have any pics of me holding him. So this morning, while Mommy was sleeping, I snuck this picture of him from my phone. I’m actually surprised how well it turned out considering it came from my phone. Needless to say, I am a proud dad. I have two wonderful kids now, and an amazing wife. I don’t know what else to say, except, I’m happy. Well, it’s official. Unless he decides to come earlier on his own, we will be going to the hospital on January 17 to induce labor and meet our new son. We’re really excited. My parents are coming to town. My 2 year old daughter talks about the baby all the time, even though I don’t think she has any idea what’s about to happen. She, all of a sudden, likes to play with the toys that were once hers and will now be his. I think she’ll be a good little helper. I will post an update here once he is born, and hopefully be able to show a couple pictures as well. Just wanted to put out a quick update about the new baby. A couple weeks ago we had an ultrasound and they thought we were having a girl. Turns out they were wrong. At out appointment on Friday there was undeniable, ummm, proof that we are in fact having a son. So, at least until they change their mind again, we have stopped shopping for pink stuff and are now shopping for blue stuff instead.